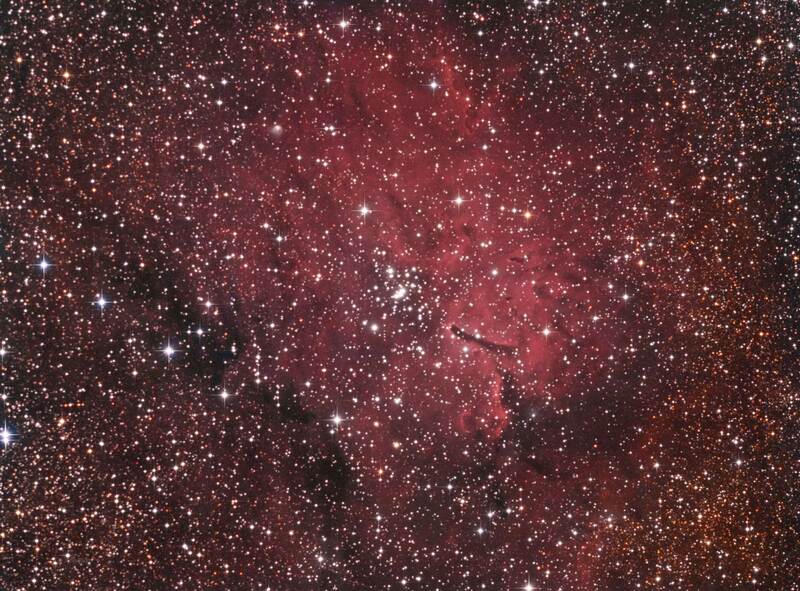 NGC 6820 is an emission nebula in the constellation Vulpecula. The most noticeable feature of this nebula is the large elephant trunk structure just below and right of the image center. This large structure gets its shape from the ultraviolet energy emitted from the young star cluster NGC 6823 at the center of my image. The outer regions of this nebula contain many small elephant trunk structures where active star formation is occurring. These stars are very young at 200,000 to 500,000 years which indicates star formation has been triggered after the main star cluster NGC 6823 was formed. This may be due to one of the earlier Type O stars going supernova and the resulting shock wave exciting gas and dust in the outer region of the nebula. There is a small planetary nebula designated as PLN-59.01 to the bottom and right of the image center just below the main elephant trunk structure. The open star cluster at the center of my image is NGC 6823 and is young at 2 million years. NGC 6823 is also considered the center of the Vulpecula OB1 Association and consists of Type O and B stars which are very young and very hot stars. The high ultraviolet energy from the cluster illuminates the surrounding gas and dust and also shapes the elephant trunk structures. There also Bok globules in the area. These globules are smaller dark clouds of dense gas and dust that are also potential star formation areas. These globules contain hydrogen, helium, carbon, plus silicate and are often responsible for formation of double and multiple star systems. Bart Bok, who first studied these globules in 1940, stated they act like “insect cocoons” as transformational vehicles. He suspected these globules were undergoing gravitational collapse but this was impossible to verify with technology at the time as it was impossible to see inside the dense cloud using images from the visible wavelength. His ideas were later confirmed in 1990 with the use of near infrared images to verify star formation inside.